Younger-looking skin --- every woman I know (including myself) wants to have it. But there could have been a time or two (or more!) in our lives when we looked at ourselves in the mirror, see our dull and dry skin, and think that MAYBE we just don’t have the genes that others seem to possess, genes that blessed other women with that elusive youthful glow. Okay, while our genetic makeup might have a say with regards to how our skin looks, our lifestyle is also a skin affecting factor. If we’re not blessed with the genes, then let’s examine our way of living and drive it down the “get beautiful skin” route. Experts agree that the habits and the choices we make affect our health – skin included – the same as or even more than our genes do. With these said, here are five overlooked yet simple tips to battling premature skin aging and getting that flawless, youthful-looking epidermis of our dreams! When you’re in your late 20s to 30s, it pays to stick to a skincare line that focuses on fighting the major signs of skin aging, premature or not. This is the time in your life where you SHOULD invest on products that really deliver. And since younger-looking skin is your main goal, the LE’VEA line is one awesome to-go-to choice. 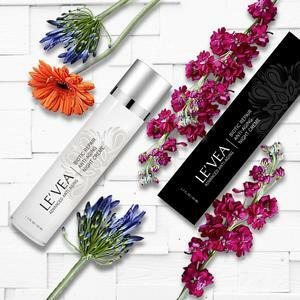 The products from this skincare line isn’t only scientifically-focused, they also contain natural skin-aging fighters, ingredients that have long been used in ancient medical practices for beautification. Besides, LE’VEA’s lineup is complete --- from cleanser to toner to serum, night cream and even eye cream. Using one beauty line instead of mixing products up is more effective. Do the necessary dietary changes. Lessening your processed and junk foods consumption, increasing your plain water intake instead of juices, caffeinated, carbonated or alcoholic drinks . . . these are but some of the necessary changes you need to do with your eating lifestyle. If you really want to improve your skin’s health, eat more foods high in antioxidants like blueberries and natural green tea. Vitamin C is another skin beautifier so get loads of that from fruits and veggies such as guavas, spinach and cabbage. Lastly, you also need to have more fares rich in beta-carotene (vitamin A) in your diet such as carrots, sweet potato and even pumpkin. Don’t scrimp on sleep; use a silk pillowcase. Sleep is one thing we need to value in our lives especially if we’re on our road to mid-life. When we’re tired or lack sleep, the signs surface to our skin making it look dull and pale. What’s more, our lack of Zzzs usually leads to breakouts because our skin didn’t have enough time to repair and rejuvenate itself. One more thing: skin experts said that silk pillowcases are better skin beautifiers than cotton or other fabrics. For one, silk doesn’t pull on your skin or cause friction which results to creases and lines when you snooze. Secondly, it doesn’t absorb whatever skin rejuvenating product you put on your face before hitting the covers. Steer clear away from stress. Poor skin tone and wrinkles are just two telltale signs that a person is stressed out. If you have either of these two, then it speaks of the quality of life you have now. Steer clear away from stress. Unplug from the internet a few hours a day (those emails and calls can wait, trust me! ), meditate or pray, go on a walk or run, swim . . . do the things that help your whole system to calm down and increase endorphin (happy hormones) production. Amp up your eye cream’s power with an eye massager. Eye creams are a must for every skincare regimen. If you didn’t know that before, NOW you do so don’t skip it. But you know what could make your eye cream more effective? AN EYE MASSAGER. Eye massagers help the eye contours absorb the product you put on them. And we all know that healthy-looking eye contours mean a healthy-looking face. On the contrary, when your eyes look tired, you’ll also look haggard in general. You see, getting youthful skin doesn’t have to be complicated.